No research cited. They qualified by adding the word “some”, though. 2016. “Researchers at the Virginia Polytechnic Institute studied the effects of a high fat diet on horses compared to a traditional grain-based diet. They found the horses on the high fat diet to be more calm, displaying lower levels of excitability and anxiety. Specific researchers are mentioned!!! But no citation was given. 2016. “Gram for gram, fat provides more than double the calories of carbohydrates or protein. And it is well digested. But there’s an added bonus: Fat has a calming effect on horses’ behaviour. Those researchers are mentioned again. The same ones. And finally! The citation was provided which I then was able to look up. Holland, J.L., Kronsfeld, D.S., and Meacham, T.N. 1996. Behavior of horses is affected by soy lecithin and corn oil in the diet. J. Animal Sci., 74 (6), 1252-1255. This one paper, apparently referenced by everyone, was published more than 20 years ago, in 1996! And as far as I could find, no one has published anything on the effect of fat as a calming agent since, but everyone seems to “know” that fat calms horses. These authors tested the very question I wanted to investigate: Do dietary fats improve tractability of horses? The control diet plus 10% (by weight) soy lecithin-soy oil (SL-SO). “Eight horses were fed each diet in random order for four 3-wk periods. Behavior was observed during the last week of each feeding period. Spontaneous activity was evaluated …. and was less in horses fed SL-CO than in controls (P = .022). less in horses fed SL-CO and SL-SO during the visual stimulus test (P = .036, .108). However, there were many articles that suggested feeding fat was beneficial for a number of other reasons, including, the perhaps most obvious, weight gain, as fat has more than twice as much energy per gram as carbohydrates. So, there is evidence (one published scientific paper, 1996) that adding 10% dietary fat can have a calming effect on horses. If a person were to decide to add fat to the diet of their horse, keep in mind that it is best to do so gradually. This article from Kentucky Equine Research provides information on dietary fat supplementation. 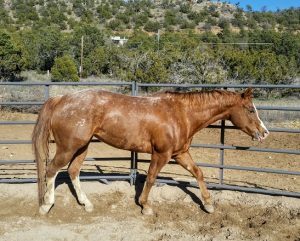 This lovely mare is Ellie, and she does not get a fat supplement. She is shiny and fat anyway. She belongs to Judith and John Huchton.